Welcome to Liverpool! Birthplace of The Beatles! Unfortunately, we only spent half a day in Liverpool, mainly because I wanted to see The Beatles museum so bad. We didn’t tour around Liverpool that much except for the streets where the Fab Four used to roam around and sing merry songs. Imagine that, decades ago, Paul, Ringo, George and John used to walk here. They’ve seen what I’ve seen! It’s so surreal. If you can’t tell yet, yes, I’m a fan of The Beatles and it’s definitely a must visit for all fans out there. A boat designed after the Titanic which was registered in Liverpool, and a yellow submarine themed boat. Before The Beatles came about, they were first The Quarrymen with John Lennon initiating the formation of the group in March 1957. July that same year, John met 15-year-old Paul McCartney and joined the band. George Harrison was then invited by John to watch the band and persisted to join despite John’s reluctance since he thought 14-year-old George was too young. The band name went through so many changes from The Quarrymen to Beatals, the Silver Beetles and finally, by August 1960, became The Beatles. The Casbah Coffee Club is where The Quarrymen used to play from 29 August to October 1959. “Aus Verkauft” meaning Sold Out. The Beatles played in Hamburg, Germany, specifically The Star-Club, from August 1960 to December 1962. They got better and better in Hamburg and other bands came to see them but as they’ve completed their stunt in Germany, they went back to their increasing popularity in Liverpool and started playing at the Cavern Club. By 1963, Brian Epstein, encouraged the group to use a more professional approach suitable for a commercial career. On 11 February 1963, the Beatles recorded ten songs during a single studio session for their debut LP, Please Please Me. Released in March 1963, the album initiated a run during which eleven of their twelve studio albums released in the United Kingdom through 1970 reached number one. (Left) Please Please Me topping the charts, (right) The Beatles’ several albums on display. 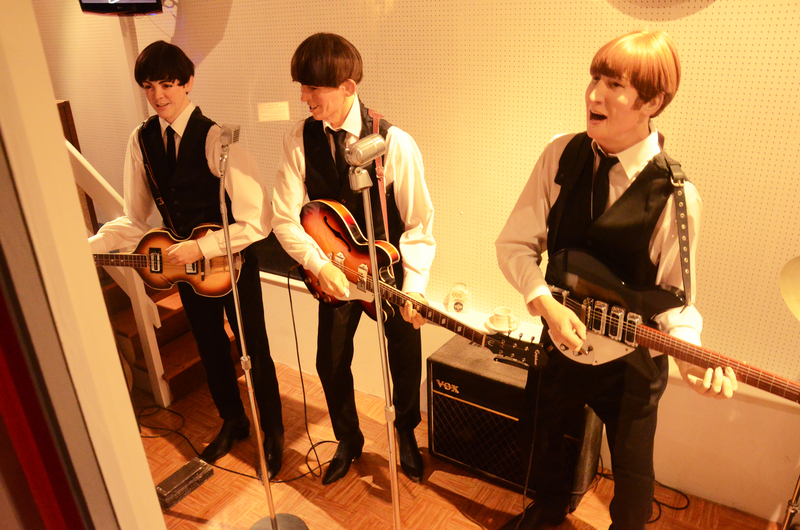 Due to the success of their singles, they’ve received nationwide popularity in Britain (screaming girls and such) which then was dubbed as The Beatlemania. By 1964, The Beatlemania invaded America. Since then, I believe, was a whirlwind decade for The Beatles full of number 1 albums, movies, drugs, women, drama and the inevitable break up in 1969. Sgt. Pepper’s Lonely Hearts Club Band, considered to have the most famous music album cover and one of the most imitated images in the world. The Beatles made sure that this album be different from any of the albums they’ve done including Eleanor Rigby which features a string octet. I don’t know why they used Comic Sans though. “Eleanor Rigby died in the church and was buried along with her name. Nobody came.” Quite a morbid song, really. There is also an Eleanor Rigby statue in Stanley Street which we didn’t get to visit but it is dedicated to “All the lonely people”. In 2004, this song was ranked number 137 on Rolling Stone’s list of “The 500 Greatest Songs of All Time”. Abbey Road is a personal favorite and it’s a bummer I didn’t get to do the famous pedestrian crossing album cover in London. A white room with John’s photos at the end of the tour. I believe this also reflects their White Album. My Paul seemed so sad. Four individual mini-rooms for each of the band members with their achievements inside. There were different memorabilia displayed all throughout the experience, one of which is John’s Harry Potter spectacles and news covers about the band and one of George’s death. Paul saying “Thanks Mo” was for Ringo’s wife, Maureen, who you can audibly hear cheering for them after the session. After the museum, it was time for some real history on the streets. Matthew Street is the location of the CavernClub. Photos and everything Beatles-related fill up the walls of the buildings in this street. As well as different shops established as tribute to the Fab Four. They used to play here! I was standing where they used to stand! I never thought the club would actually still be up and running. I thought it’d be just a tourist spot nowadays but no, they actually serve beer (day and night) and play music still. A nearby building which houses different Beatles’ symbols such as this hanging centerpiece and a statue of the band playing. You can sense that Liverpool embraces the Beatles and their fame very much as it is everywhere all over the city. That one picture which isn’t related to the Beatles.. Liverpool’s city centre. Their city centre is really big, this is not even an eighth of it. With that said, I will certainly get back to Liverpool and visit the non-Beatles spots.